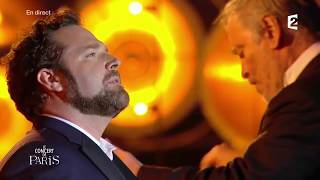 On the heels of La traviata at Opéra National de Paris, Bryan Hymel performs Puccini’s Madama Butterfly in his first summer at the Chorégies d’Orange festival in France. The American tenor, who performed the role of Pinkerton to great acclaim at the Metropolitan Opera in 2014, brings his “robust tenor and ringing top notes” to the festival stage this July (New York Times). Bryan sings alongside Ermonela Jaho as Cio-Cio San, Marc Barrad as Sharpless, and Marie-Nicole Lemieux as Suzuki. Mikko Franck leads the Orchestre Philharmonique de Radio France and the Choirs of the Operas of Avignon, Nice, and Toulon in performances on July 9 and 12. Returning to the role later in the year, Bryan opens Teatro alla Scala’s 2016-17 season on December 7.